International competition over, prizes given out. Let’s see the three best concepts according to Belarusian jury. Winning one seems to make the best of existing structure. Main guideline and constraint at the same time was to retain the historical colonnade surrounding stands at Stadion Dinama. As for inside, outside and above it, architects were free to do as they please, providing that sufficient capacity (0f 40-41,000) and UEFA/FIFA regulations can be met. The competition launched back in 2012 engaged some 40 offices from around the world. Judging commission selected 18 for the final vote and by the end of January chose three best, all presented below. On Feb 15 each office received their prizes of, respectively, $40,000, 20,000 and 10,000. Winning bid was prepared by German GMP Architekten, who are expected to start working on final design along with Belarusian partners. It’s expected to resemble their competition entry, though may obviously differ to some extent. 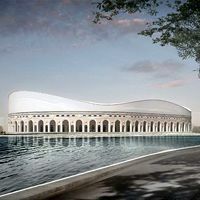 Inside the existing elliptic arcades stands are to be built from scratch, dropping the running track and switching Stadion Dinama to football-specific mode. One tier would encircle the pitch symmetrically, while the upper one would have different height depending on location – lower alongside the pitch (reaching only the level of the colonnade) and much taller behind goals. Wavy roof and façades are to become a light extension of the colonnade. At the same time the superstructure can be covered with LED lighting to allow dynamic illumination. Team of Belarusian architects led by Boris Shkolnikov decided to build stands that would become a contrast to the old, monumental arcades. Single blue sections grow out of the old structure with staircases and roof supports between them. Beneath the stands 5 levels of usable space are planned, with extensive underground parking. Room for this was generated by moving stands close to the pitch, with no running track. Seating layout seems rather typical with two tiers of comparable size, except of course for the lower level being pierced with roof pylons. One of very few entries that plans on retaining both the running track and seating layout of the old stadium. Only a small portion of seating would be modified, while the most important point is the expressive red-green dome that would cover all stands. Additional infrastructure to meet all UEFA/FIFA regulations and accommodate corporate clients would be created at the main stand. Historical colonnade, though retained, would be completely dominated by the new dome.